When it comes to getting a ‘zillion things home’, it is Wayfair that one looks up to. Starting as a freshman in the marketplace with a shoestring budget strategized in a solo-bedroom apartment, Wayfair, today stands as the largest international marketplace for a zillion things home- from home décor, interior decoration materials, contemporary and traditional furniture to side accessories such as barstools to birdhouses. With more than 250 standalone websites under its hat, this marketplace is the most sought after destination for every online seller. If you are an e-retailer for home décor and furnishing goods and intend to channelize your sales through various segments, ChannelSale has the right facilitation solution for you. Catalyze and expand your business to its truest potential by being a seller at Wayfair. With our well-acclaimed reputation of providing ecommerce solution and multi-channel marketing solution for all sellers, we are the one you can rely upon. The Wayfair online shopping experience is a delight for anyone and everyone who wants to have the best possible get up for their homes. This has given the Wayfair marketplace quite a recognition among e-retailers. And with the cutthroat competition in the world of marketing, multi-channel marketing has become the ‘it’ word among e-retailers. The yen for exposure through various channels and distributing vast array of products across various platforms has become the buzzword for sellers. If you are still wondering about how to sell on Wayfair and be a successful seller and at the same time, track down your performance at the marketplace; then do not! 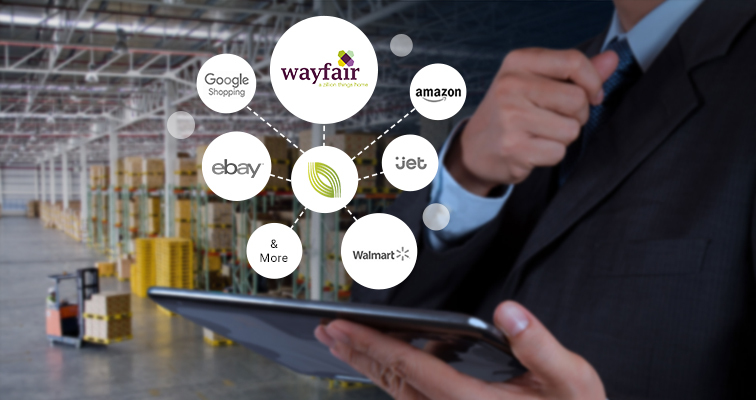 We provide product feed management in sync with the Wayfair feed manage program, with our highly efficient software solutions to ease your e-retail business hassles. Why opt for ChannelSale Wayfair Sellers Software Solutions? Our expert professional team helps fulfill your aims of successfully selling on Wayfair with our highly efficient product listings, real-time inventory and order management services. We provide you detailed product performance reports and analysis. We work in sync with the Wayfair product feed optimization services, and hence you need not worry about the all-round performance of your products and maintain a consistent efficiency throughout. We offer you adequate services for Wayfair product feed integration and management. The ChannelSale management team is in constant collaborative action with the Wayfair management and hence, it eases the sale of your products and maintaining a constant product performance track work. We step in proactively so that your varied Wayfair product listing gets the right visibility. ChannelSale’s Wayfair plugin directly links up with our pre-configured integrations on webstores examples Magento, BigCommerce, Volusion, Shopify, 3D Cart, NetSuite, Yahoo store, AmeriCommerce & more; shipping / order management solutions examples ShipWorks, ShipStation, OrderMotion, OrderLogix, StoneEdge & more; Accounting software QuickBooks; Repricers etc. Our ace marketing pros and experts are always there to help you out in the Wayfair integration process. So come and join hands with ChannelSale and be the most sought after retailer among all Wayfair sellers. ChannelSale can create your product listings on Wayfair via your product feed file in formats CSV, TXT, XLS or API-XML and further synchronize them across all the other top online marketplaces, comparison shopping engines and affiliate networks. Supports simple or multi-variation products / parent–child relationships. Products can have multiple sizes, colors, material type etc. Granular level product category mappings to ensure your products get listed in appropriate matching Wayfair product category. Have variable pricing for Wayfair and other marketplaces / shopping engines, or retrieve your Amazon, eBay pricing to be sent to other shopping engines or markup pricing over cost price. Custom product data attributes are supported. In order to optimize the product listings on the shopping sites, the best practice is to include data for as many product attributes as available. Examples: Bullet point descriptions, search terms, video link, multiple warehouse inventory, gender, pattern etc. Real time inventory updates – avoids over-selling and under-selling issues. For example - If a product sells on Amazon, eBay, Sears, Rakuten, Newegg, Wish etc., the updated remaining quantity in hand would reflect in your ChannelSale account and further on Wayfair as well. Business rules available to easily suppress products that are to be excluded from being sent to specific shopping sites. Add-on custom automated business rules to modify product data such as merge fields, add new content, markup pricing over cost, and many more business rules. Centrally manage all Wayfair orders and shipping tracking updates. Automate exporting Wayfair orders to third party order fulfillment platforms / dropshipper’s, Fulfilled by Amazon, or to suppliers on an hourly basis. Setup to automatically retrieve order shipping tracking number on Wayfair. ChannelSale is one of the fastest emerging multi-channel e-commerce software solutions. Trusted by hundreds of merchants around the world, we’re on a mission to make online selling easier, efficient and cost-effective. 511 Sixth Avenue, #24, New York, NY 10011, United States. 1506, Cyber One, Plot 4 & 6, Sector 30A, Vashi, Navi Mumbai, India. 400703. Sign up and be the first to receive exclusive offers, the latest ecommerce news and inspirational tips!